By default, when you create a controller object using the mpc command, no constraints exist. To include a constraint, set the appropriate controller property. The following table summarizes the controller properties used to define most MPC constraints. (MV = plant manipulated variable; OV = plant output variable; MV increment = u(k) – u(k – 1). 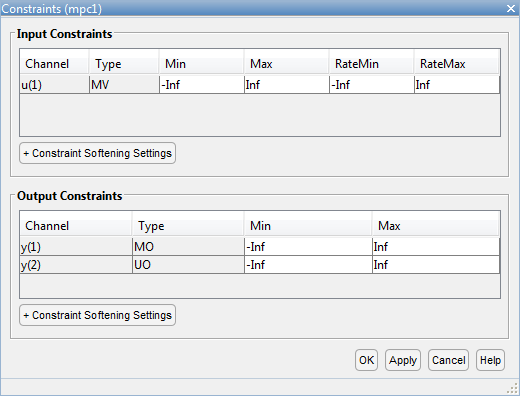 To set the controller constraint properties using the MPC Designer app, in the Tuning tab, click Constraints . In the Constraints dialog box, specify the constraint values. See Constraints for the equations describing the corresponding constraints. Include known physical limits on the plant MVs as hard MV bounds. Include MV increment bounds when there is a known physical limit on the rate of change, or your application requires you to prevent large increments for some other reason. Do not include both hard MV bounds and hard MV increment bounds on the same MV, as they can conflict. If both types of bounds are important, soften one. Do not include OV bounds unless they are essential to your application. As an alternative to setting an OV bound, you can define an OV reference and set its cost function weight to keep the OV close to its setpoint. All OV constraints should be softened. Consider leaving the OV unconstrained for some prediction horizon steps. See Time-Varying Weights and Constraints. Consider a time-varying OV constraint that is easy to satisfy early in the horizon, gradually tapering to a more strict constraint. See Time-Varying Weights and Constraints. Do not include OV constraints that are impossible to satisfy. Even if soft, such constraints can cause unexpected controller behavior. For example, consider a SISO plant with five sampling periods of delay. An OV constraint before the sixth prediction horizon step is, in general, impossible to satisfy. You can use the review command to check for such impossible constraints, and use a time-varying OV bound instead. See Time-Varying Weights and Constraints. Hard constraints are constraints that the quadratic programming (QP) solution must satisfy. If it is mathematically impossible to satisfy a hard constraint at a given control interval, k, the QP is infeasible. In this case, the controller returns an error status, and sets the manipulated variables (MVs) to u(k) = u(k–1), that is, no change. If the condition leading to infeasibility is not resolved, infeasibility can continue indefinitely, leading to a loss of control. Disturbances and prediction errors are inevitable in practice. Therefore, a constraint violation could occur in the plant even though the controller predicts otherwise. A feasible QP solution does not guarantee that all hard constraints will be satisfied when the optimal MV is used in the plant. If the only constraints in your application are bounds on MVs, the MV bounds can be hard constraints, as they are by default. MV bounds alone cannot cause infeasibility. The same is true when the only constraints are on MV increments. However, a hard MV bound with a hard MV increment constraint can lead to infeasibility. For example, an upset or operation under manual control could cause the actual MV used in the plant to exceed the specified bound during interval k–1. If the controller is in automatic during interval k, it must return the MV to a value within the hard bound. If the MV exceeds the bound by too much, the hard increment constraint can make correcting the bound violation in the next interval impossible. When there are hard constraints on plant outputs, or hard custom constraints (on linear combinations of plant inputs and outputs, and the plant is subject to disturbances, QP infeasibility is a distinct possibility. All Model Predictive Control Toolbox™ constraints (except slack variable nonnegativity) can be soft. When a constraint is soft, the controller can deem an MV optimal even though it predicts a violation of that constraint. If all plant output, MV increment, and custom constraints are soft (as they are by default), QP infeasibility does not occur. However, controller performance can be substandard. To soften a constraint, set the corresponding ECR value to a positive value (zero implies a hard constraint). The larger the ECR value, the more likely the controller will deem it optimal to violate the constraint in order to satisfy your other performance goals. 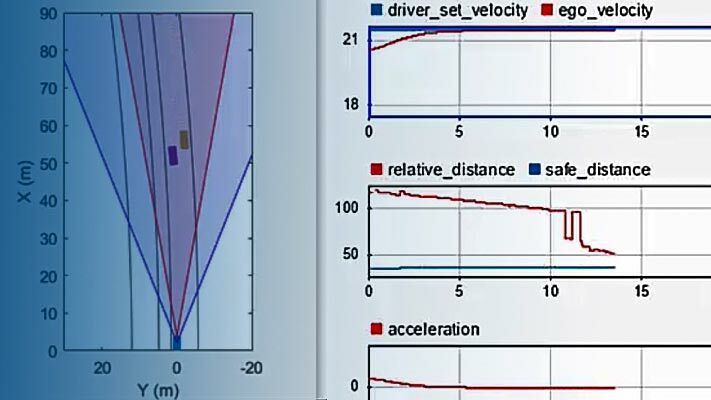 The Model Predictive Control Toolbox software provides default ECR values but, as for the cost function weights, you might need to tune the ECR values in order to achieve acceptable performance. Thus, the slack variable, εk, no longer appears in the above equations. You have also specified soft constraints on plant outputs with Vj,miny(i)>0 and Vj,maxy(i)>0. Now, suppose that a disturbance has pushed a plant output above its specified upper bound, but the QP with hard output constraints would be feasible, that is, all constraint violations could be avoided in the QP solution. The QP involves a trade-off between output reference tracking and constraint violation. The slack variable, εk, must be nonnegative. Its appearance in the cost function discourages, but does not prevent, an optimal εk > 0. A larger ρε weight, however, increases the likelihood that the optimal εk will be small or zero. Notice that Vj,maxy(i) does not set an upper limit on the constraint violation. Rather, it is a tuning factor determining whether a soft constraint is easy or difficult to satisfy. Use of dimensionless variables simplifies constraint tuning. Define appropriate scale factors for each plant input and output variable. See Specify Scale Factors. Use the overall constraint softening parameter of the controller (controller object property: Weights.ECR) to penalize a tolerable soft constraint violation relative to the other cost function terms. Set the Weights.ECR property such that the corresponding penalty is 1–2 orders of magnitude greater than the typical sum of the other three cost function terms. If constraint violations seem too large during simulation tests, try increasing Weights.ECR by a factor of 2–5. Be aware, however, that an excessively large Weights.ECR distorts MV optimization, leading to inappropriate MV adjustments when constraint violations occur. To check for this, display the cost function value during simulations. If its magnitude increases by more than 2 orders of magnitude when a constraint violation occurs, consider decreasing Weights.ECR. Disturbances and prediction errors can lead to unexpected constraint violations in a real system. Attempting to prevent these violations by making constraints harder often degrades controller performance.